Green Army participants are working with The Mulloon Institute to create a series of V-shaped brush weirs to halt erosion and help retain sediment as close to its as source possible. The work is taking place in the Mulloon Catchment in NSW on eroding gullies that are scarring the landscape and removing valuable farming soils. 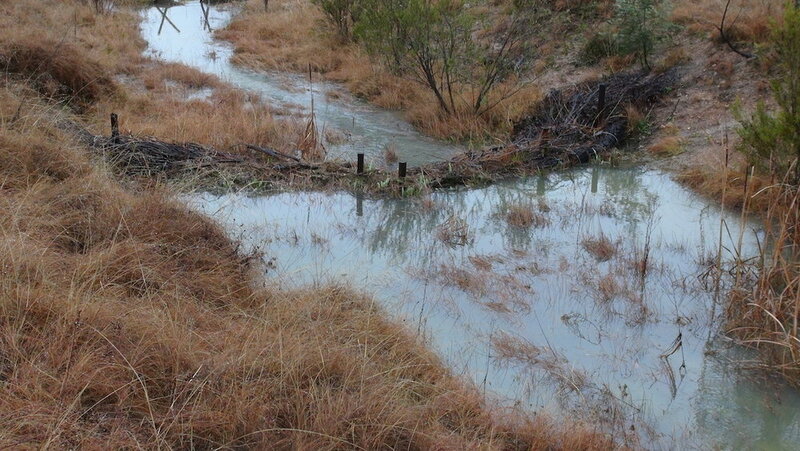 The brush weirs aim to slow the flow of water and promote vegetation establishment using natural materials found onsite. Construction involves staking and wiring logs to the gully’s bed, then adding bulk by securing brush material or woody weeds to it. When water flows over the weirs, sediment and organic matter are captured where they help create habitat for a range of native plants and animals. While the structures have a finite life, site management and appropriate plantings allow vegetation to take over the repair process of the structure and landscape. The weirs form part of the Mulloon Community Landscape Rehydration Project, which aims to rebuild natural landscape function and resilience for the entire Mulloon Catchment. It currently spans 23,000 hectares and involves 20 local properties.